1. 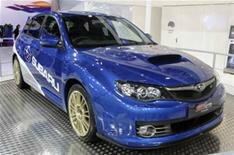 Subaru Impreza WRX STi S380 | What Car? The WRX STi S380 - so called because of its 380PS power output - is technically a concept at this stage, but it will go on sale in the UK this November for around 40,000. No performance figures have been released, but we do know that expert performance-tweaking company, Prodrive, has worked on the car to a real nuts-and-bolts level, rebuilding the engine to produce the headline power output. Suspension, exhaust, bodykit, wheels and tyres are all also new, and designed to give the Impreza a real shot in the arm. It has all the makings of a classic, but at that price tag you'll be lucky to spot one, let alone afford it.